RESNET ISSUES HERS INDEX ENERGY CREDITS FOR DRAIN WATER HEAT RECOVERY (DWHR) TECHNOLOGIES. – Builders and homeowners now have a new, cost-effective way to reduce their Home Energy Rating System (HERS) Index scores. Drain Water Heat Recovery (DWHR) technology uses outgoing warm drain water to pre-heat incoming cold fresh water. The result is that the primary water heater uses less energy to provide domestic hot water for the home and, at the same time, increases the effective hot water capacity. The US Department of Energy reports that water heating is the second largest energy use in single-family homes and multi-family buildings across America. DWHR technology is recognized as an energy saving measure (www.energy.gov/energysaver/articles/drain-water-heat-recovery) and many utilities currently have incentive programs for adoption of DWHR technology. RenewABILITY Energy Inc. has been manufacturing the Power-Pipe® DWHR technology for over 10 years. The CEO and Founder, Gerald Van Decker, states, “Including DWHR technology in new homes has become common practice for many builders in Ontario in the last few years and over 35,000 homes now have the Power-Pipe….in fact the Power-Pipe will be included in at least 1 out of every 3 new homes built this year in the Toronto region. A HERS Index credit has been available in Canada for over 2 years. I’m pleased that American builders and homeowners can now use Drain Water Heat Recovery technology to reduce their HERS Index scores by 1 to 3 points, dependent upon a number of factors including house size, location and DWHR rated efficiency.” RESNET (Residential Energy Services Network) has designed a spreadsheet tool that calculates and permits for a HERS score improvement by installing DWHR technology. It accompanies approved HERS software. 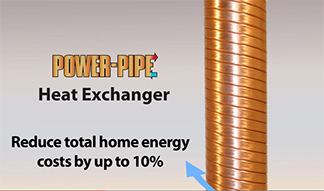 Power-Pipe® Drain Water Heat Recovery technology is affordable, practical, and proven. It has no moving parts and requires no maintenance. The Power-Pipe primarily saves energy from showers, which use up to 80% of the hot water in homes, apartment buildings, and health clubs. The Power-Pipe works with any type of water heating system and is also used in many commercial operations such as hotels, hospitals, laundry facilities and restaurants as well as in industrial processes. HomeDepot.com has been offering the Power-Pipe to homeowners, contractors, and builders online for over 2 years now: www.homedepot.com/s/power-pipe?NCNI-5. Typically the Power-Pipe reduces water heating energy consumption by 20 to 35%, though smaller units save less and the larger units can provide up to 48% energy savings in the average home. Putting this into perspective, “whole-home energy consumption” is usually reduced by 4 to 7% and as much as 10%. RESNET is responsible for creating the national training and certification standards for HERS Raters and Home Energy Survey Professionals, both of which are recognized by federal government agencies such as the U.S. Department of Energy, the U.S. Environmental Protection Agency and the U.S. mortgage industry. For more information contact Steve Baden at sbaden@natresnet.org or visit www.resnet.us.